According to the Centers for Disease Control and Prevention (CDC), a national survey of pregnancy-related deaths was started in 1986. This was because more clinical information was needed to fill data gaps about the causes of maternal deaths which were and continue to be rising. According to the CDC, a pregnancy-related death is defined as the death of woman while pregnant or within one year of termination – regardless of the duration or site of the pregnancy – from any cause related to or aggravated by the pregnancy or its management, but not from accidental or incidental causes. The CDC requested reports from all 50 states and individually from the cities of New York and Washington, D.C. Copies of death certificates for all women who died during pregnancy or within one year of their pregnancy and copies of the matching birth or fetal death certificates, if they have the ability to perform such record links, were produced for analysis by the CDC. This information was then summarized by a medically trained epidemiologist to determine the cause and time of death related to the pregnancy. 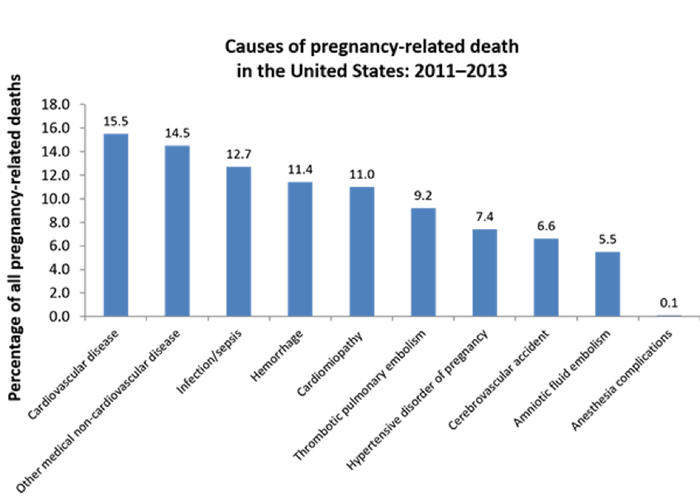 Causes of death were coded by using a system established by the American College of Obstetricians and Gynecologists (ACOG) and the Centers for Disease Control Prevention- Maternal Mortality Study Group. This system was started in 1986. The now collected data helps physicians, clinicians and public health professionals to better understand why pregnancy-related deaths are on the rise. It is also important to understand this data to take the necessary steps to prevent this troubling trend. The pregnancy-related mortality ratio is an estimate of the deaths of the pregnancy-related deaths for every 100,000 live births. According to the CDC, “this ratio is often used an indicator to measure the nation’s health.” During the 20th Century, the pregnancy-related mortality ratio fell significantly in the U.S. The decline was predictable because of medical and technological advances. 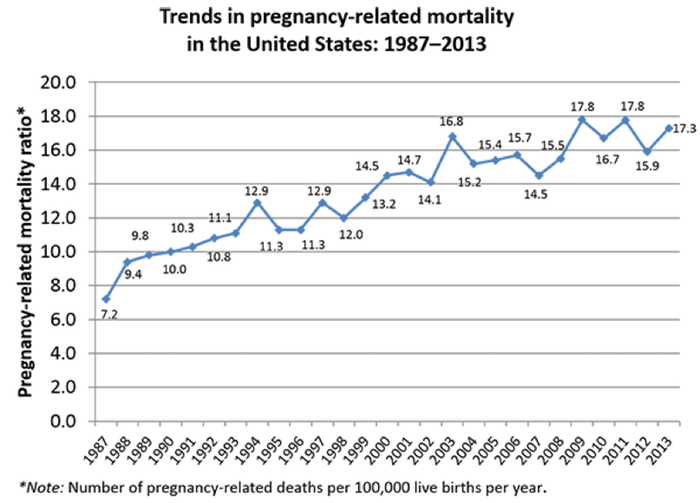 Since the Pregnancy Mortality Surveillance System was first implemented the number of reported pregnancy-related deaths in the U.S. steadily rose from 7.2 deaths per 100,000 live births in 1987 to a high of 17.8 deaths per 100,000 in 2009 and 2011. The CDC graph shown below visualizes clearly this rise in pregnancy-related deaths in the U.S. up through 2013. Although there is no known specific reason for the overall increase in pregnancy-related deaths, many studies have shown an increased number of pregnant woman in the U.S. have chronic health problems such as hypertension, diabetes and chronic heart disease. These medical conditions can put a pregnant woman at a higher risk of pregnancy complications. The higher pregnancy-related mortality ratios during the period of 2009-2011 are presumed to be due to an increase in infection and sepsis deaths. Many of the maternal deaths between 2009 and 2011 were related to the influenza endemic which occurred in the U.S. The highest number of maternal deaths reported during 2011 through 2013 were caused by cardiovascular diseases. The chart below shows the causes of pregnancy-related deaths in the U.S. for the years 2011 through 2013. This data collection shines a bright light on the fact that today in an advanced society, the United States, with all of the advantages of highly skilled and trained physicians and medical providers, maternal deaths have continued to rise. Obstetricians, nurse midwives, labor and delivery nurse and medical providers are aware of the risks of injury or death to the fetus, newborn and mother. Obviously there must be more safeguards put in place around Chicago, Illinois and the country to stamp out this worrisome trend. Hospital and labor and delivery practice leadership must take action to prevent maternal deaths. There is also an alarming number of fetal deaths that should be addressed by leadership as well. If you or someone you know or love has been injured or died in or after labor and delivery or as defined as a maternal death by the negligence of a doctor, nurse midwife, labor and delivery practitioner or other medical provider, Kreisman Law Offices is prepared to handle your case. Robert Kreisman of Kreisman Law Offices has more than 40 years of experience successfully handling maternal death cases. Kreisman Law Offices has prevailed in trials and substantial settlements in Chicago, Illinois and its surrounding areas and has resolved cases for wrongful death claims and maternal death cases for these many years. With our years of experience in trying and settling maternal death cases, newborn death cases and wrongful death matters, Kreisman Law Offices provides the best possible services to our clients and have achieved unsurpassed results. Our service is unmatched. Please call us 24 hours a day at 312.346.0045 or toll free 800.583.8002 for a free and immediate consultation with Robert Kreisman or complete a contact form online on our website.